Trading options is a bit more complicated than trading stocks. This section will guide you through the process. 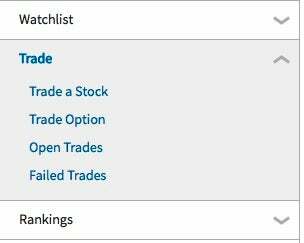 Similar to buying stock, you must first click on the "trading tab" near the top of the screen. You must now click on the "Trade Option" link that appears on the space directly below the tab menus. Enter the stock symbol for the company you wish to buy the options on. 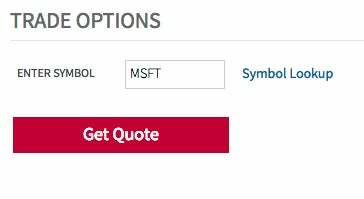 For example if you want to buy options on Microsoft, enter "MSFT". Hit the "Get Quote" button afterwards. Now you should have an option chain similar to the one below. Select the expiry month that you wish to trade the option in, and then click on the highlighted symbol that corresponds with the strike price you wish to trade at. 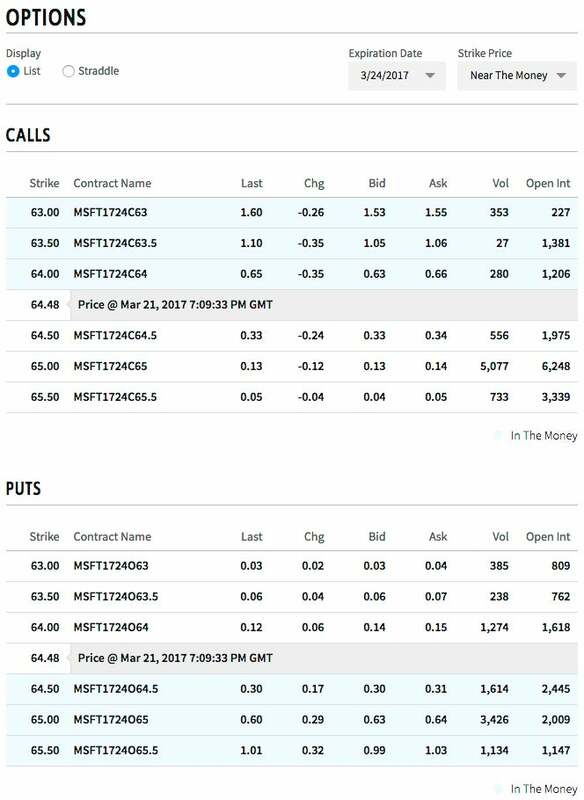 Call options are always listed on the top of the page, and put options on the bottom. 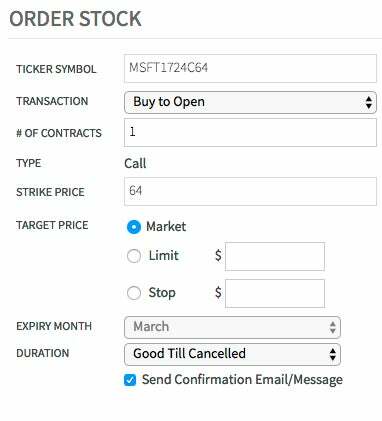 For example, in the option chain below, if you wanted to buy a March 2017 call option on MSFT with a strike price of 64.00, then you would click on MSFT1724C64. 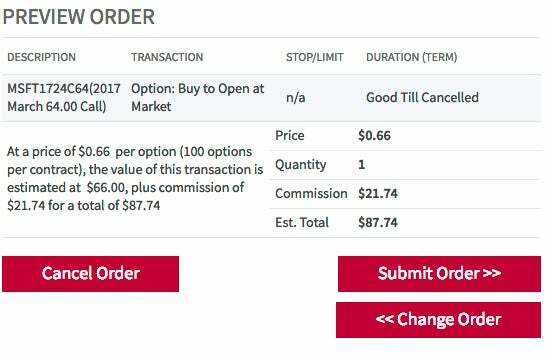 Notice that the last trade of this particular option is quoted at 0.65 per option. Notice that the ticker symbol, expiry, strike, and type of option are already entered in for you. Just enter the number of contracts you wish to buy (we selected 1 contract; 1 contract equals 100 options) and click "Preview order". Take a look at the Preview Order page. Since you can only purchase options in contracts (where 1 contract represents 100 options), the total price of 1 option contract of MSFT1724C64, is $87.74 (the options cost $2.00 ($0.66/option x 1 contract x 100 options/contract)) and a commission of $21.74). If everything looks good, then click on the "Submit Trade" button. As long as there isn't any problem with the trade, your order will be executed and the option will be placed in your portfolio in around 20 minutes (or at the beginning of the next trading day, if the trade was submitted after trading hours). Learn how trading volume and open interest can give you an edge when trading options.